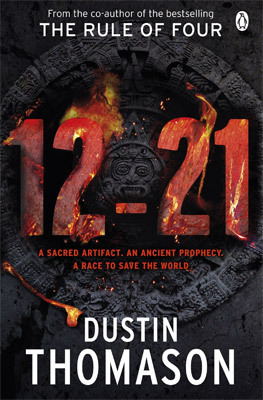 12-21 is the first solo novel from Dustin Thomason; the co-author of 4 million- copy-bestsellerThe Rule of Four. In the first week of December 2012, the codex finds its way into the hands of the Antiquities Curator of the Getty Museum, Chel Manu, the world authority on ancient Mayan inscriptions. She is torn between her duty to alert the authorities and this once in a lifetime chance to translate the codex herself. Dustin Thomason co-wrote the number one International and New York Times bestseller, The Rule of Four. He earned his BA in Anthropology from Harvard College and his Medical Degree from Columbia University. He has written and executive-produced the American television series The Evidence and Lie to Me. He lives and works in Los Angeles. 12-21 is Dustin's first solo novel.